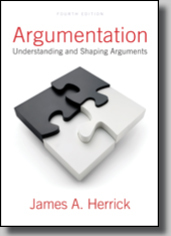 My goal in the sixth edition of Argumentation: Understanding and Shaping Arguments, as in previous editions, is to provide an accessible, up-to-date, ethically grounded, and audience-centered guide to arguments as they occur in public and private settings: in personal conversation and professional meetings, in civic and political discourse, in the mass media and on the internet, through digital and social media. This text’s practical treatment of marketplace argumentation remains grounded in classical and contemporary rhetorical theory, and promotes the standards of constructive public discourse that inform the rhetorical tradition as well as contemporary approaches to critical thinking. Conversations with colleagues suggest that faculty seek a clear, engaging, yet intellectually rigorous book that helps students participate confidently in public discourse, while at the same time nurturing the ethical values essential to a flourishing democracy. Students indicate that they appreciate a serious, useful guide to evaluating the vast array of persuasive writing and speaking they encounter. I have sought to integrate these concerns in developing the sixth edition of Argumentation: Understanding and Shaping Arguments for the twenty-first century classroom and our increasingly digital culture. Writing in response to my own teaching needs, feedback to earlier editions, and the best contemporary practices of public discourse, I have tried to maintain the basic approach and foundational pedagogical features that colleagues tell me they have found helpful in their own classrooms. I have also updated examples throughout the book and developed new sections to reflect current issues and media, such as social media and podcasts, as well as recent theoretical insights. I hope you will find this new edition to be a thorough, intellectually challenging aid to teaching courses such as argumentation, rhetoric, critical thinking, public speaking, and expositional writing. I believe that the most effective teaching of argumentation keeps the proven practices of everyday argumentation in view, focusing particularly on the most reliable ways that we actually reason in public and private settings. The guidelines students encounter here for evaluating arguments are thus flexible suggestions rather than rigid prescriptions. Students are encouraged to see them as standards of critical assessment that should always be employed with a corresponding concern for audience, ethics, and context. As this approach acknowledges how we actually reason with one another, it also encourages students to become rational judges of arguments rather than fallacy detectives. Although fallacies are discussed, these reasoning mistakes do not occupy a central place in the discussion of arguments. Similarly, the principles and language of debate are addressed in an appendix, but I have not written with a guiding concern for the technicalities of formal debate. At the heart of Argumentation: Understanding and Shaping Arguments is a focused concern for how people reason with one another every day, as well as how our reading and writing practices can be improved through a solid introduction to the principles of sound, ethically grounded argument. The ethics of argument plays a key role in the book. Students are reminded that arguments emerge in contexts that include audiences and advocates, both of whom possess personal values and moral responsibilities. Students are encouraged to consider the ethical obligations they incur whenever they enter the public arena as advocates. These obligations include respect for the audience, fidelity to the truth, and regard for the settings in which arguments develop. This ethical orientation is introduced in an early chapter and maintained throughout the text. As any classroom instructor knows, relevant and timely examples are crucial to student engagement and thus to successful teaching. In keeping with my focus on marketplace argument, this new edition reflects a determined effort to provide examples that are contemporary, pertinent to student concerns, and derived from the actual practice of public discourse. Examples are drawn from business, sports, medicine, technology, politics, interpersonal relationships, international affairs, religion, environmental issues, and personal decision-making; from oral conversation, printed sources, the mass media, the internet, social media, and other digital discourse. In addition to addressing the traditional concerns of argument studies - linguistic clarity, validity, evidence, ethics, fallacies - Argumentation explores narrative and visual elements that are important to much contemporary discourse. Moreover, the internet and social media are situated here as arenas for radically expanded public discourse. This new edition also recognizes the need for contemporary students to develop digital literacy. Toward this end, it sets characteristic digital forms of argument—for example, texts and tweets—in the context of the broader concerns of public discourse. Such communication innovations shape how we interact about ideas and policies, and are here integrated into the discussion of public advocacy. An emphasis on the importance of sound, principled, open public discourse in rational, democratic decision-making. An accessible, foundational theory of argument rooted in classical and contemporary rhetorical tradition. Clear explanations of how various types of arguments—from formal syllogisms to simple comparisons—develop in diverse public and private settings. A practical and adaptable approach to developing and evaluating arguments, based on the criteria of evidence (support), validity (sound structure), and linguistic consistency (clear and consistent definitions of key terms). A focus on argument ethics, with an early chapter on ethics and attention throughout the book to the ethical responsibilities of advocates. Emphasis throughout on preparing students to be skilled practitioners of written and spoken public discourse, as well as fully equipped critics of the arguments they encounter. Discussions of narrative and visual argument that explore how stories and images are incorporated into persuasive cases, and that provide guidance for evaluating such approaches to argument. A presentation of the internet and social media as sources of evidence and as important locations for public discourse. A detailed discussion of the Toulmin Model and its value to advocates and critics, with examples showing how this model can be used to discover unstated reasons and evaluate public arguments. This sixth edition adds several new features that enhance its content and clarity. These revisions are in response to my own experiences with the book and to suggestions from colleagues. Many updated examples and exercises, reflecting current issues, recent events, and new media forms. Expanded discussion of internet resources and discourse, including social media and a new section on podcasts, as resources for advocates and as locations for public discourse. An expanded discussion of visual evidence and visual argument, with illustrations of contemporary uses. A new discussion of conspiracy theories that treats these persistent and misleading narratives as problems of evidence and its critical evaluation. A practical vocabulary of more than 200 terms that provides students with categories and concepts crucial to composing and evaluating arguments. Key terms are listed at the beginning of each chapter and in the glossary at the end of the book. Numerous application exercises at the end of each chapter that allow students to practice new skills. Epigrams to engage student interest at the beginning of each chapter. Pull quotes and boxed figures to underscore key points and help engage students visually. Photographs introducing each part division, adding visual interest and underscoring the pervasiveness of argument in everyday life. Recommended websites listed at the end of each chapter, providing resources for extending the discussion of crucial topics covered in the text. An Instructor’s Manual with sample syllabus, additional exercises, suggested written assignments, and other teaching resources, available to instructors who adopt the book. This sixth edition of Argumentation: Understanding and Shaping Arguments consists of eighteen chapters, organized in six parts that reflect the book’s central concerns, plus two appendices that may be employed at any point in the semester. Part I, “Goals, Skills, and Functions of Argumentation,” consists of three chapters that introduce the basic language and theory of argument, as well as analytic tools that help students grasp the inferential structure of arguments. Chapter 1, “An Introduction to Argumentation,” explores ways in which argumentation functions in the deliberation and decision-making of individuals and groups. This chapter also considers the crucial role of values and agreements in argumentation, as well as how the internet and social media function as forums for public discourse. Chapter 2, “The Elements of Arguments,” sets out a foundational theory of argument, including various types of claims and how each type of claim may be reasonably supported. The chapter also discusses interpretations of evidence, and how such interpretations may vary according to the diverse values that individuals bring to the argumentative situation. Chapter 3, “Tools for Analyzing Arguments,” presents students with practical analytic tools for grasping the structure and content of any argument. The discussion of the Toulmin Model, an important tool of argument analysis, reveals its potential for assessing truncated arguments such as those found in digital media. Part II, “The Conditions of Constructive Argumentation,” consists of two chapters that examine the qualities of sound arguments and the characteristics of ethical advocates. Chapter 4, “Ethical Advocacy,” prompts students to consider advocates’ ethical obligations and provides an ethical foundation for subsequent topics taken up in the text. The chapter’s centerpiece is the discussion of a virtues approach to ethics, focusing on the moral commitments that ethical advocates exhibit in argumentative situations. Chapter 5, “Reasonable Arguments, Reasonable People,” sets out three considerations relevant to assessing any argument: evidence, structure, and clear language. The chapter also examines characteristics of reasonable people, such as an attitude of openness to the views of others. Part III, “Support: The Content of Arguments,” addresses the crucial topic of evidence in argument. The chapter addresses the issues of online research, while also offering detailed information about using traditional sources such as books and periodicals. Chapter 6, “Evaluating Evidence,” provides a guide to assessing the quality of evidence, including tests such as accessibility and recency. The discussion of visual evidence, expanded in this edition, reflects current research on its use in argumentative cases. A new section considers conspiracy theories as a problem of evidence misuse. Chapter 7, “Locating and Evaluating Sources of Evidence,” explores methods of evaluating a range of sources, from books and magazines to interviews and websites, and includes a new section on podcasts. The chapter also includes a section on assessing a source’s political perspective. Chapter 8, “Using Statistics as Evidence,” considers the issues and mechanics of generalizing from a sample. The chapter also helps students to determine when statistical evidence is used well—or employed carelessly to mislead an audience. Chapter 9, “Using Testimony as Evidence,” sets out basic types and tests of testimony to assist students in evaluating and employing testimonial evidence. Part IV, “Validity: The Structure of Arguments,” considers the important and often overlooked issue of argument structure. Chapter 10, “Validity in Conditional and Enumeration Arguments,” examines the structure of arguments that develop around necessary and sufficient conditions, as well as arguments that follow an enumeration or partition pattern. Chapter 11, “Validity in Categorical Arguments,” takes up the structure of arguments that manage categories or definitions, and introduces a set of validity tests to help students navigate a sometimes complex process of testing validity. Part V, “Linguistic Consistency: Language in Argument,” is made up of two chapters that explore issues ranging from definition and ambiguity to common problems of expression such as redundancy and mixed metaphor. Chapter 12, “Definition in Argument,” takes up the central role played by strategic definitions in argumentative settings. Sources of definitions as well as their various uses in argumentation are considered. Chapter 13, “Ambiguity, Equivocation, and Other Language Considerations,” helps students recognize and avoid common language mistakes that cloud the clarity of thinking, writing, and speaking. Part VI, “Types and Tests of Arguments,” covers the types of arguments encountered in public and private settings, and presents practical and accessible methods of evaluating these arguments. Chapter 14, “Analogies, Examples, Metonymy, and Narratives,” explores ways of reasoning from one or a limited set of cases, reasoning by comparison of cases, reasoning from part to whole, and the role of narrative in argument. Chapter 15, “Reasoning about Causes,” presents an accessible guide to the difficult issue of establishing the cause of individual occurrences or classes of events, and to assessing arguments from sign. Chapter 16, “Moral and Practical Arguments,” covers four arguments that are often discovered in advertising and political discourse, and that engage our moral commitments or pragmatic inclinations. Chapter 17, “Essential Nature Arguments,” addresses arguments built around claims regarding the essential nature of institutions, individuals, and documents. The discussion of reasoning from images and other visual representations, often used to sum up essential nature, has been expanded and updated in this edition. Chapter 18, “Fallacies and Appeals,” surveys erroneous approaches to reasoning. It also discusses the difficult issue of appeals to the emotions and to authority. The Appendices, “Developing and Adapting Your Case,” discusses and provides guidelines for developing a case and presenting it to an audience. Appendix A, “Policy Case Construction,” discusses the elements of an effective case supporting a proposal and covers the basic vocabulary of policy debate. The discussion of basic debate terms and concepts, is explored through a case study, which is new to this edition. Appendix B, “Adapting Arguments to an Audience,” provides students with a highly practical guide to audience adaptation, including the audience’s demographics, moral commitments, and relationship to the topic and the advocate. A case study for analysis, with commentary, illustrates the principles discussed in this appendix. Argumentation: Understanding and Shaping Arguments is designed to encourage students to assume the role of capable, responsible, and informed advocates who participate effectively and ethically in the public arena. The text’s tested approach is intended to help students become better, more self-assured producers and consumers of public and private discourse. It is my hope that, as a result of our helping a new generation of students to understand and practice argumentation, the crucial reasoning processes that keep democracy vibrant will be enhanced. I offer this new edition in the belief that we all stand to gain when the citizens of our democracy are well equipped to read, think, write, listen, and speak with skill and confidence. 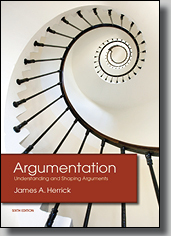 Many individuals have had a hand in forming this new edition of Argumentation: Understanding and Shaping Arguments and the editions that preceded it. As the present book would not have been possible without their assistance, I would like to take this opportunity to acknowledge their help and to thank them. Teaching at least one section of argumentation every semester provides me with continuous opportunity to test material and solicit the reactions of students to the text. I would like to thank the many students in my Analytic Skills course here at Hope College whose suggestions and comments have improved both topic presentation and the quality of exercises in each chapter. A number of colleagues at colleges and universities across the country have also provided helpful feedback that contributed in important ways to enhancing every aspect of the sixth edition of Argumentation. My thanks to Jennifer Biedendorf, California State University, Stanislaus; Martin Camper, Loyola University Maryland; George Dionisopolous, San Diego State University; Michaela Frischherz, Towson University; Jill James, Tarrant County College; Sarah Kornfield, Hope College; Christopher Leland, Colorado Christian University; Heather May, Emerson College; Sarah T. Partlow Lefevre, Idaho State University; Margaret Michels, Pennsylvania State University; Samuel Mayer Nelson, Cornell University; David Romanelli, Loyola University Chicago; and Joel S. Ward, Geneva College. I would also like to acknowledge the contributions of reviewers of previous editions. These include Stephen Andon, Nova Southeastern University; R. V. Barello, Lewis University; Diane M. Blair, California State University, Fresno; Robert Boller, University of Hawai’i Manoa; Diana I. Bowen, University of Houston–Clear Lake; Beth Brunk-Chavez, University of Texas at El Paso; Michael L. Butterworth, Ohio University; Martha S. Cheng, Rollins College; George N. Dionisopoulos, San Diego State University; Larry Eby, Goldey-Beacom College; James M. Farrell, University of New Hampshire; Michael Fleming, Mount San Jacinto College; Douglas Fraleigh, California State University, Fresno; Adam Gaffey, Texas A&M University; Morgan Ginther, University of Memphis; Robert Greenstreet, East Central University; Lisa M. Gring-Pemble, George Mason University; Cory Hillman, Central Michigan University; Treva Hodges, Indiana University Southeast; Erica Hollander, Metropolitan State College of Denver; Deborah L. Hoover, Tiffin University; Randall Iden, Northwestern University; Brandon Inabinet, Furman University; Carl Isaacson, Bethany College; Bryan P. Jacobs, Dixie State University; Lenore Langsdorf, Southern Illinois University; Ilon Lauer, Western Illinois University; Karen King Lee, University of Nebraska–Lincoln; Thomas M. Lessl, University of Georgia; Charles Lester, Palm Beach Atlantic University; Ryan Louis, Ottawa University; Beth Innocenti Manolescu, University of Kansas; Cynthia Martin, James Madison University; Nancy Nichol Meyer, Metropolitan State College of Denver; Margaret M. Michels, Pennsylvania State University; David Moss, Crafton Hills and Mt. San Jacinto Colleges; Carroll Ferguson Nardone, Sam Houston State University; Samuel Mayer Nelson, Cornell University; Clark Olson, Arizona State University; Frank O’Mara, State University of New York, College at Oneonta; Jennifer Reem, Nova Southeastern University; Kevin Stein, Southern Utah University; Fred Sternhagen, Concordia College; Abbie Syrek, University of Nebraska at Omaha; Phillip Voight, Gustavus Adolphus College; Dennis L. Wignall, Dixie State College; Joel Worden, Goldey-Beacom College; David Worthington, DePauw University; and David Zarefsky, Northwestern University. Thanks are also due to the Hope College Communication Departmental office manager Linda Koetje for her careful attention to various aspects of manuscript preparation and correspondence with the publisher. I also want to thank Kathleen Domenig of Strata Publishing for the extraordinary care and high level of professionalism she brought to every detail of production, and for a number of important recommendations regarding the text’s structure, tone, and appearance. Finally, my deepest gratitude to my wife for her good nature and patience.